This article was written By Jon Jung on 01 Jun 2013, and is filed under Reviews. 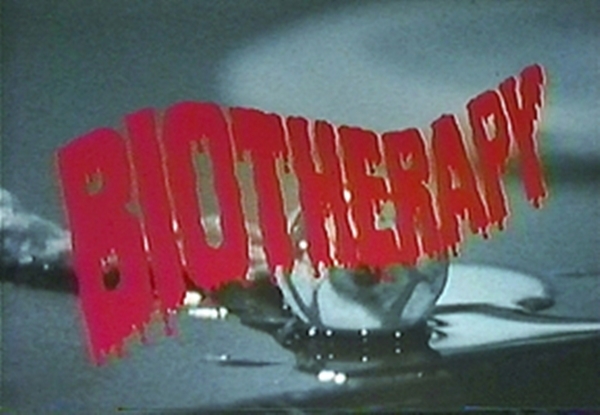 Biotherapy is a horror/sci-fi shocker that clocks in just short of an hour. That’s right, short of an hour. Because of the film’s truncated time, you know that a lot of things like characterization and logic are bound to get pulled out of the story like an eyeball from a screaming scientist. And what’s left of that story? Some scientists at the Hirose Research Institute of Biology have developed a GT (glutamyltransferase, in case you were wondering) serum derived from meteors, which speeds up biological growth. As it turns out, not everyone is cool with this major scientific breakthrough. 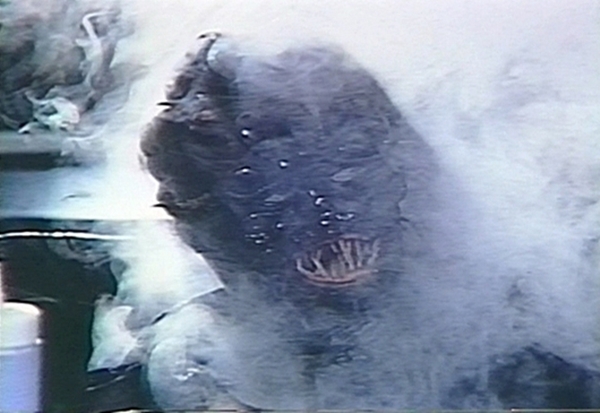 An ugly alien-like thing described as a miraijin or time traveler (and probably played by the director’s big brother) has been sent to retrieve the serum and cause the most unnecessarily gory violent deaths on those who developed it. Why? At under an hour, do you care? Actually, since no edition of this film has any kind of English subtitles, the time traveler’s modus operandi is made even fuzzier due to difficult to comprehend dialog overdubbed with the kind of cheesy echoplexed “demonic” voice that has been used in Japanese TV and films forever. Let’s just assume that our time traveler friend objected to the social and moral ramifications of the serum’s use or, heck, maybe he just wanted to tear various limbs and innards from a gang of earthfolk. It’s all about the same thing, isn’t it? Gore-wise, director Akihiro Kashima has some pretty nifty scenes peppered throughout the film, which did win a special effects award from Young Jump, a manga magazine. There is one scene in which a character is stabbed in the chest with several test tubes and blood pumps out of her chest, geyser-like. This is the type of scene I was looking for (and failed to get) in Commando‘s death-by-pipe-impalement scene. Curious comparisons have been made between Biotherapy and the Guinea Pig series and, while both have direct-to-video/V-Cinema origins and their share of on-screen entrailsectomies, tonguesectomies, and eyesectomies, on the whole, the comparison is misleading. If anything, Biotherapy owes a lot to ’80s slashers, Friday the 13th in particular; the time traveler wears a mask through which he breathes heavily à la Jason as he is stalking his victims. In an unintentionally humorous touch, his appearance is signaled with a lightning-like flash and a synth drum beat, a quite auspicious appearance for someone trying to be sneaky. In all, not an entirely bad film to check out if you can. It’s certainly not much of a time investment and this fact alone will make splatterheads giggle with glee that one gore scene is just around the corner from another. In the end, however, there are better things you could do instead of watching Biotherapy. Like watching half of a better film.